Riley Ferrell does not have any MLB stats for the season. Draft: 2015, Houston Astros, 3rd rd. Riley Cole Ferrell...attended Texas Christian University...led Big 12 and was 11th nationally with 14 saves as a junior in 2015, his final season with Horned Frogs...performance earned him 1st Team All-Big 12 Conference and 1st-team NCBWA All-American honors... holds school record with 32 career saves. 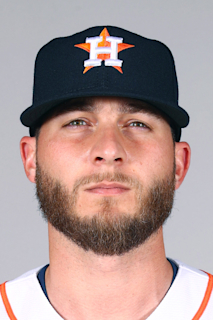 Opened season at Double-A Corpus Christi in Houston's system, posting 2-2 record, 1.90 ERA (23.2 ip/5 er), and converting 7-of-7 save opportunities in 21 appearances...Missed April 24-May 6 on 7-day DL with left thigh strain...Earned Texas League Pitcher of the Week honors for June 11- 17 after picking up two saves and a relief win in three outings, shutting out his opponents over 5.2 innings, allowing just two hits and striking out nine...Did not allow an earned run in last 12 outings for Hooks (15.0 ip)...Walked just two batters over his final 13 outings for Corpus Christi, striking out 24 in that time...Held right-handed hitters to .138 (8x58) average for Hooks, compared to .250 (6x24) for left-handed batters...Made career Triple-A debut on June 28 with Fresno. Went 2-1, 6.75 (28.0/21) in 22 appearances (2-of-2 in save chances)... Tied career high (second time) with five strikeouts on August 31 at Salt Lake..Went 2-0 with 3.12 ERA (8.2/3) over final six appearances for Grizzlies, with 14 strikeouts and three walks. For the first time in his three-year career, was healthy for an entire season, making 38 appearances combined between Double A Corpus Christi (36g) and Class A Buies Creek (2g)...at the two stops, went 2-2 with six saves, a 3.67 ERA (22ER/54IP) and 60 strikeouts in 54.0 innings pitched...began the year at Buies Creek and made two appearances before being promoted to Corpus Christi on April 13...finished his season at the Double A level. Made eight appearances at Class A Lancaster, posting four saves and a 1.80 ERA (2ER/10IP)...placed on the DL on May 12 and missed the remainder of the season. Made his professional debut for Class A Quad Cities, making 12 appearances with a 1.08 ERA (2ER/16.2IP)... those 12 appearances added onto a long collegiate season at TCU in which he made 30 appearances en route to the College World Series. December 13, 2018 Miami Marlins claimed RHP Riley Ferrell off waivers from Round Rock Express. June 27, 2018 Riley Ferrell assigned to Fresno Grizzlies from Corpus Christi Hooks. May 6, 2018 Corpus Christi Hooks activated RHP Riley Ferrell from the 7-day disabled list. April 24, 2018 Corpus Christi Hooks placed RHP Riley Ferrell on the 7-day disabled list. January 25, 2018 Houston Astros invited non-roster RHP Riley Ferrell to spring training. June 29, 2017 Corpus Christi Hooks activated RHP Riley Ferrell from the temporarily inactive list. June 25, 2017 Corpus Christi Hooks placed RHP Riley Ferrell on the temporarily inactive list. April 13, 2017 RHP Riley Ferrell assigned to Corpus Christi Hooks from Buies Creek Astros. March 17, 2017 RHP Riley Ferrell assigned to Houston Astros. September 30, 2016 Riley Ferrell roster status changed by Lancaster JetHawks. May 12, 2016 Lancaster JetHawks placed RHP Riley Ferrell on the 7-day disabled list. May 4, 2016 Lancaster JetHawks placed RHP Riley Ferrell on the temporarily inactive list. April 5, 2016 RHP Riley Ferrell assigned to Lancaster JetHawks from GCL Astros. September 9, 2015 RHP Riley Ferrell assigned to GCL Astros from Quad Cities River Bandits. August 18, 2015 Quad Cities River Bandits placed RHP Riley Ferrell on the 7-day disabled list. August 13, 2015 Quad Cities River Bandits activated RHP Riley Ferrell from the 7-day disabled list. August 4, 2015 Quad Cities River Bandits placed RHP Riley Ferrell on the 7-day disabled list. June 28, 2015 RHP Riley Ferrell assigned to Quad Cities River Bandits. June 26, 2015 Houston Astros signed RHP Riley Ferrell.